Many of my 48 Christmas celebrations have passed with little to make them stand out – but this year will be one I remember, because it is the first since Tom died where I feel a genuine sense of peace and even joy. There have been no complicating bouts of intense grief, but only grateful memories of our life together and gratitude for the life that I still have. But it got me thinking about some of the memorable Christmas days of my life. The first real memories I have of Christmas come when I was ten or eleven. We were living in Monterey, California and we had a new baby in the family. We were all so thrilled that Alex had joined our family and we all fought to be the one to hold him, to play with him, to show him off. I remember how exciting it was to arrive in Utah with this exciting baby to share with our grandparents. It may have been the same year, or maybe the next, but I remember I received a pair of overalls that my mother had made and embroidered with a rainbow – I LOVED those overalls and biked up to my best friend’s house to show them off in the hour or so we had before our family packed up our truck to head to Utah. Another Christmas from my childhood that stands out in my memory is one we spent in Topsham, Maine. For once there was snow on the ground and another baby in the family. Together with another family in our church congregation we had a Christmas Eve program with a live nativity – all of us children dressed up and taking parts, with my youngest brother as the baby Jesus. It was a singular experience in our family to act out the Christmas story and even my teenager self felt some stirrings of the Spirit and the wonderful gift of our Savior’s birth. There was the Christmas in San Diego when my next youngest brother, Travis, woke all of us up WAY too early in the morning and we huddled around in his darkened room, waiting for the hour when our parents would FINALLY let us get up – Dad going first to turn on the Christmas lights and ready his camera. I remember all the Christmas wrappings going up in flames in our fireplace, followed a few days later by the dying Christmas tree!! My first Christmas away from home was spent in St. Sebastian de los Reyes, Spain. I was a missionary for my church and I was sharing a small apartment with two other American women. There was a Christmas party with the all the missionaries in the mission a few days before – we got a chance to meet up with friends from the various areas we had served in, sang carols and picked up packages from family, and were challenged to remember why we were serving as missionaries and to keep our focus on the message of the Savior that we were sharing. The night before, the two Elders in our district had joined us (they staying out in the hall to follow the rules) to exchange goodies and a couple of carols. On Christmas morning we opened our packages from home and then were invited to spend the day with an American family living in the area. I think we got to call home and visit with family – but international telephone calls were so expensive in those days, that the call was surely brief and I don’t remember it. Two years later I spent my last Christmas with my family as an unmarried child. I was determined to have this last Christmas with them before everything changed. We had a close friend and neighbor join us for Christmas Eve festivities and there were musical numbers performed. My dad filmed the evening and we have had a lot of fun watching our younger selves. What I remember most is that my fiance was not pleased that I was in San Diego, California and we were getting married in Salt Lake City, Utah two days later and he was worried that something would happen!! But traveling on Christmas day was practically a tradition in our family – after all the present opening was finished, we piled into our cars and headed eastwards. I was sick the next day (another worry for Tom!) and on the 27th he was so relieved when I showed up to the wedding breakfast healthy and happy to be there. Our second Christmas as a married couple will always be a special one because it was the day we discovered we were going to be parents. I had my suspicions, so we decided we would do “the test” on Christmas morning. It was a big gamble, looking back, because we had been trying to have a baby for over a year and it would have been such a disappointing day if the test came back negative. But I was pretty sure and we must have been anxious about it because we woke up early (4:30 or 5:00am) and couldn’t go back to sleep. Finally I got up and did the test and there was the positive indicator! We were so excited and awed and in disbelief. Of course we couldn’t go back to sleep so we just laid in bed and talked and planned and laughed. And then … we kept it a secret. I look at pictures of that morning and I can see how happy we were and how we looked like we had this amazing secret. But it was kind of cool to have this special thing just between the two of us. It still ranks as the best Christmas gift I have ever received. Our first Christmas as a family of five was pretty exciting as well. I made new Christmas stockings for the family – the kids requested giant size stockings and got to pick out their own fabrics. For once Tom and I felt the stress of Christmas Eve preparations – stuffing stockings, finishing up gift wrapping and setting everything out under the tree – it was all such a bigger production than we had ever had before – but it was also so fulfilling to finally have a full mantle of stockings and to feel like our family was finally starting to feel the way we had imagined when we first got married. One more memory – the year we decided to change up our Christmas day traditions and introduced a bit of torture to the game. Tom felt like Christmas was practically over by 7am and wanted to mix things up a bit. So together we came up with a new routine. When the kids got up we opened Santa gifts and stockings – and then we made them all come to breakfast. Tom always made something yummy for breakfast and we all got into the act, helping make juice and rolls and whatever tasks he gave us as his sou chefs. Then we told the kids to go get dressed. And then we told them we were going to the movies. They were a little appalled that there were still gifts to be opened and we were LEAVING THE HOUSE but they got over it! And thus the Christmas day movie tradition was born in our home. After the movie we returned to our home and took turns opening all the family gifts. It was the perfect new tradition that made our family feel more united and gave us great memories to look back on. Christmas looks different now – this year it was just Haley and I at home. Spencer and Kayla are making their own family Christmas memories. Andrew is spending his second Christmas away from home. I’m sure in the coming years, things will continue to change and there will be new special Christmases to remember. And one common gift of each year will be the gift of our Savior, Jesus Christ, whose birth and life and death can change our lives and bring peace in times of sorrow and meaning and joy at all times. How grateful I am that every year I have the chance to celebrate and worship the gift of God’s only begotten Son to the world. This week was Tom’s birthday. I remember the first birthday we celebrated without him – he’d been gone just barely two weeks. I was still in a state of shock. We had dinner with family and brought along a lemon cake that Tom had a fondness for. Last year, grateful to have one of Tom’s signature recipes, I invited all my local family and made rice and beans to celebrate. The food tasted exactly like I remembered. It felt like the perfect tribute. Afterwards I was violently ill and worried that somehow I had given everyone food poisoning!! But I realize now it was probably some sort of emotional reaction. This year I finally feel like I am emerging from a dark place after an emotionally difficult summer. I didn’t want to somehow disrupt the fragile peace and happiness I am feeling and didn’t plan any kind of celebration. But as the day arrived, it felt like we should do something. Driving home from school with Haley, I asked what she wanted to do. She suggested getting balloons to release. I suggested we get a key lime pie which was a favorite of Tom’s. On the way home I remembered that there were still a couple of filets in the freezer and thought I could fire up the grill and give cooking steaks another try. Summer grilling was a standard in our home and steak was certainly Tom’s favorite food to grill!! So we put together an impromptu birthday dinner and it felt perfect. After we ate and wrote our birthday messages, we walked out our backyard and into the park and let the balloons go and remembered how much we love Tom. Yesterday I decided it was time to clean out Andrew’s room. When he left last fall I just closed the door so I didn’t have to look at the holes in the walls and the mess. When my sister came to stay (when was that??) I did have to go in and clean and change sheets and vacuum so her kids could stay in the room, but afterwards I closed it back up. This summer we have all realized that Andrew is probably not going to come back home to live. His goal now is to start preparing to transition to independent living (though not until he ages out of the program he is currently in). Although I’m relieved because Andrew not living at home has been SO much better for Haley (and me), it has also been a little heartbreaking. Tom and I spent ten LONG years doing everything we could think of (and learned about) to help Andrew develop emotionally healthy bonds to our family. We love him and were consistent and reliable and got him appropriate professional help and supported him with his challenges… And he is living in a very restrictive environment where he is making very little progress and he doesn’t want to come home to live – just to visit. All of which tells me that living in a place where he doesn’t have to deal with emotional attachment is somehow easier for him than trying to live with the give and take of family ties. That is hard to accept. The most important things in my life are precisely those emotional ties to family and friends – those are the things that give my life meaning and happiness. I feel like he is rejecting the very things that will fill up that chasm he has been trying to fill his whole life. But at least right now he is unwilling to believe that. Anyway, I went in yesterday and bagged up all the clothes that he’s grown out of and set aside the few things that he could still use to be sent to him. I put away in his keepsakes bin the few things he had hung on his wall (and found a few more things he had stolen and secreted away). The bed is pretty thrashed, so I think I’ll replace it with another one we can use for guests … But next up is repairing all the holes in the walls and repainting the room – and maybe think more seriously about replacing the carpeting in the house – his room is particularly terrible. Haley and I made a run to Goodwill so everything is already gone. It’s crazy how much better I feel now when I think about that room. Haley finished her first year of high school – Yay!! And her grades were significantly better than her last year of middle school or even her first semester as a freshman. I’m really proud of her. We (meaning my kids, my parents, and I) got to visit with Andrew for the first time since he enrolled at Storm Ridge Ranch. He got to have an off-site visit, so we picked him up the Wednesday after Haley finished school and he spent Wed, Thurs, and Fri with us at my parents home. There were some encouraging improvements, but he still has a long way to go. After that visit he had a couple of altercations with other boys at the school, as well as stealing, so he’s back to no visits again. We had hoped to see him one more time before school started, but unfortunately Andrew’s choices made that impossible. Haley went to our annual church Girl’s Camp in June. This year was her fourth year and girls in that group do a couple of days of backpacking – they hiked 13 miles one day (although I don’t think it was planned to be quite that long!). She and her cousin shared a pup tent and Haley says the 4th year hiking days were the best part of the week-long camp. After their backpacking, the girls joined the rest of camp, which was held at the YMCA of the Rockies this year – which meant they slept in a lodge. At least they didn’t get rained out this year! My parents celebrated their 50th wedding anniversary this year. We’ve been talking about this year for a long time … at least four or five years. Originally we thought it would be fun to celebrate by going on a cruise as a family (my parents and my siblings – no kids). After much discussion, we settled on an all-inclusive resort instead (owing to family members who have terrible motion-sickness and/or very much dislike water!). 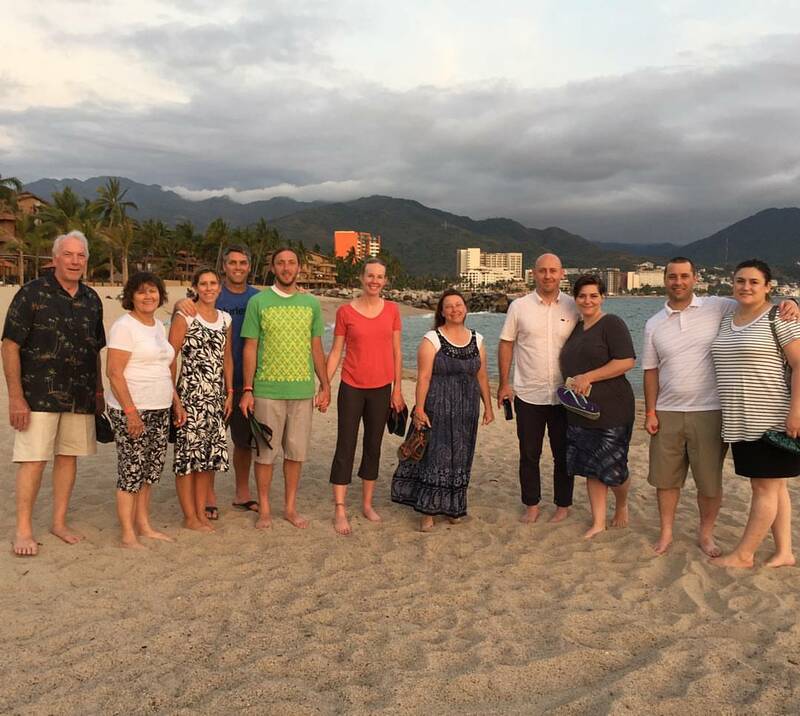 So, the second week of June we all flew out of Denver to Puerta Vallarta. I had to get a passport and everything! (actually, it is kind of nice to have a valid one again – I am already thinking of places I’d like to go) We spent a full week hanging out on the beach, eating yummy food, drinking (virgin) drinks (the wait staff started making jokes about it after a couple of days of us all stipulating “sin alcohol” all the time! ), and just generally enjoying each other. I’m very happy to report that there were no fights and we all like each other as much as ever – which is a big deal when there are eleven different personalities to consider. Haley and I took a pottery class in July and learned to throw pots on a pottery wheel – I liked this so much that I’m taking another class this month too – it’s nice to feel creative in a new way. And it’s really fun to get my hands all dirty!! So that was the summer. And yes, it is over, because Haley is back in school. Things I didn’t do this summer … I didn’t get on top of my yard. Despite many hours of weeding, it is still a jungle out there. I only planted a couple of pots this year – none in the back yard at all – and my drip lines are not working well, so they haven’t done as well as they could have. I didn’t do any diy projects – heck, I hardly did any housework. The paint chips are still stuck to my walls from my abortive plans to repaint my main floor. There’s that pesky matter of the super high vaulted ceilings that I’m pretty sure my fear of heights won’t let me tackle – which means I have to actually make a call to find a person to paint those walls – which means I am still procrastinating. I’ve been thinking a lot about this summer – I’ve always loved summer. When I was young it represented freedom … no school! time at the beach! sleeping in! Even as an adult, this feeling has lingered. Summer means not having cold feet, and enjoying long summer evenings where it is still light at 9pm, and hamburgers cooked on the grill, and flowers, and green trees. Except – the last few summers those feelings of euphoria have been elusive. The summer Tom died was full of the stress of dealing with Andrew’s theft and the consequences we imposed and then Tom’s heart surgery. I can remember being grateful when school started – I was ready for that terrible summer to be over. Unfortunately that hope that things would get better wasn’t realized. Last summer my parents took Andrew for six weeks, and that part was really nice. But I was still in my first year of mourning Tom’s death and there was that looming anniversary. I felt like summer was just a waiting game to get to September 1st. This year I don’t really have any excuses … but my heart hasn’t been in it this summer. I hate to think that I’ve lost my love for the season, but I’m beginning to wonder. How many good summers will it take to outweigh the trauma of one bad? Not sure about that, but part of me is rather glad to be back on schedule – seminary starts on Monday, so I’ll be up early and busy preparing lessons each afternoon (though I have a partner this year, so only half the lessons this time around!). I’ve already seen the eye doctor, the dentist, and made appointments to have the safety recalls fixed in my cars – I feel so industrious!! Anyway, here’s hoping next summer will be a more joyful one. Haley and I recently had a mini Harry Potter movie marathon (just the last four movies). As always, it was great to be back in that world and made me think about re-reading the series again. One thing that has stuck with me over the last week or so is how important the theme of trust is, particularly in the books. Harry is mentored by Dumbledore and of all the adults in Harry’s life, he is the one person Harry is most likely to trust (though generally speaking he doesn’t really trust any adults, since they are always letting him down). When a number of the characters doubt that Snape is really on the side of good, Lupin explains that he trusts Dumbledore, so he trusts Snape despite all appearances to the contrary. Later it seems that trust was misplaced – Snape kills Dumbledore which makes everyone feel justified in their doubts. As Harry, Ron, and Hermione set out on the horcrux hunt, Harry is faced over and over again with evidences that he didn’t know Dumbledore – that he shouldn’t have trusted Dumbledore, that Dumbledore was just using him. In the end, Harry has to make a choice. He chooses to trust Dumbledore, even when it means that Harry must sacrifice himself. It is only after Harry acts – willingly goes to his own death – that everything is revealed. Snape was really on the side of right and Harry was not a sacrificial lamb – though Dumbledore was only guessing, his guess was a good one and Harry lives to fight another day. Harry’s trust – and everyone else who trusted that Dumbledore could rid the world of Voldemort – was not misplaced. Though things seemed bleak, though Dumbledore seemed duped, or crazy, or hypocritical, or scheming – in the end he did what they all hoped he could do. As a member of the Church of Jesus Christ of Latter-day Saints, I belong to a church led by living prophets of God. In this world, that is not a popular thing in which to believe. People seriously doubt the existence of God and certainly if He exists, He isn’t anything like what the Bible teaches. As for prophets that speak for God – that really is requiring too much faith in a mere mortal. I have had spiritual experiences that have helped me to know that God is real. I have studied the Bible and modern scripture and that has also served to strengthen that belief and knowledge of God. I have even had experiences where I have heard the words of our modern prophet and apostles where the Spirit testified that they were speaking for God, and I can see clearly that this is the pattern God uses throughout scripture. But … there are many times when the things preached by the prophet and apostles go directly in the face of popular culture and accepted wisdom. There are things that are hard to understand, that seem too harsh, that are uncomfortable to accept and practice. There are things that don’t make any sense (and this is nothing new – consider God’s commandment to sacrifice Isaac or to put blood on the doorposts of the houses). So … I find myself feeling a little like Harry. Where am I going to put my trust? Will I believe even when it doesn’t make sense, even when it might mean the sacrifice of my feelings, my cherished habits, my likes and dislikes, my life even? In the end I do choose to trust. I do choose to follow, even when it is difficult. I trust that God loves all His children and He knows what He is doing. It isn’t easy – especially in the face of loud voices who tell me I’m wrong, I’m mean, I’m deluded, I’m foolish. But I have hope that in the end I will see, just like Harry did, that my trust wasn’t misplaced. Here’s something that I miss since Tom has been gone … There’s no one that knows me and who sees me in that uniquely intimate way that spouses have. When I get dressed up, there’s no one to say, “wow, you look great today!” or if I’ve done something around the house, he’s not there to say, “great job on the slip covers”. There’s no one to notice when I fix something or do something hard or that I’m having a low day. It’s weird and makes me feel solitary in a way that has nothing to do with having friends or family around. It’s one of the perks of being married that I enjoyed – both the being seen and the seeing. I know there were days when my encouragement and appreciation made Tom feel like what he did mattered even when he had had a bad day. I have a lot more admiration for my single friends now – I didn’t realize how much that connection meant to me until I’ve had to do without it. I also miss being able to check in with him – “was that mean? Am I being unreasonable? Is my understanding of this realistic?” Now I just have to figure it out in my own because he’s not around to give me a reality check! I find myself trying to rely on God more – taking my concerns to Him, trying to listen more to impressions. It’s been a positive development in this new life I’m living, though I feel chagrined that I didn’t do it more when Tom was alive. It does remind me a little of my experience as missionary. Because I left a lot of my personal concerns and preferences behind for 18 months, I was more connected to Heavenly Father. Now that I’m not investing all that emotional energy in my relationship with my spouse, there’s room to put more into my relationship with God. I wouldn’t have chosen this, but I trust that He knows how this whole experience can be put to my best benefit if I can just stay open and teachable. It’s not easy though. Some days I just want to be a spoiled child and throw a tantrum about the fact that I have to keep living this life without my best friend!! Chairs are done! Thanks to my mom who helped me fix a major mistake and then sewed my pillow covers together. I did finish the seat cushion covers and I’m not giving you a close up! The room is coming together. Now to sew throw pillows…. Three years later! 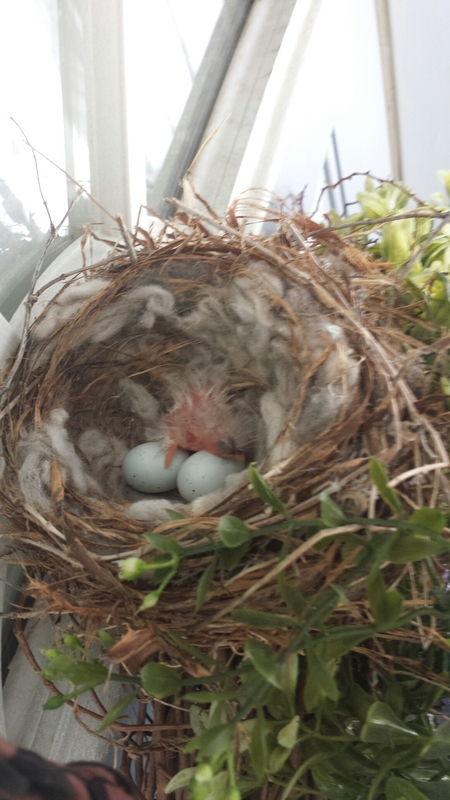 Our other update… At least one egg has hatched. There’s a tiny bit of fluff with a big mouth in the nest. 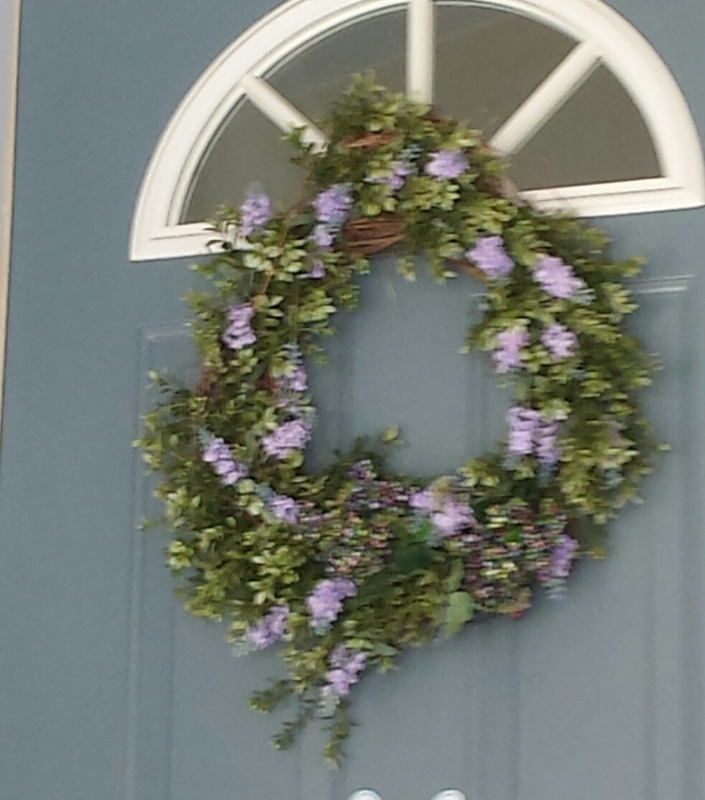 I have this lovely wreath on my door that makes me think of spring. This year it is really making me think of spring. Does it look a little bulky on top? It should. It’s hiding a nest! 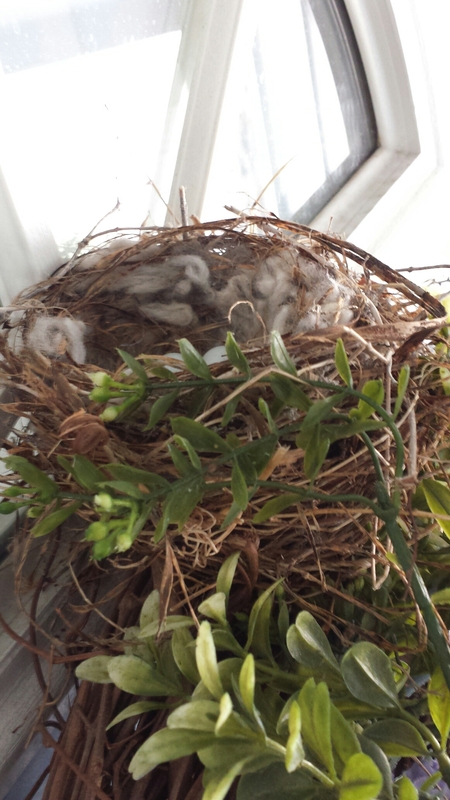 And inside that nest… Eggs! 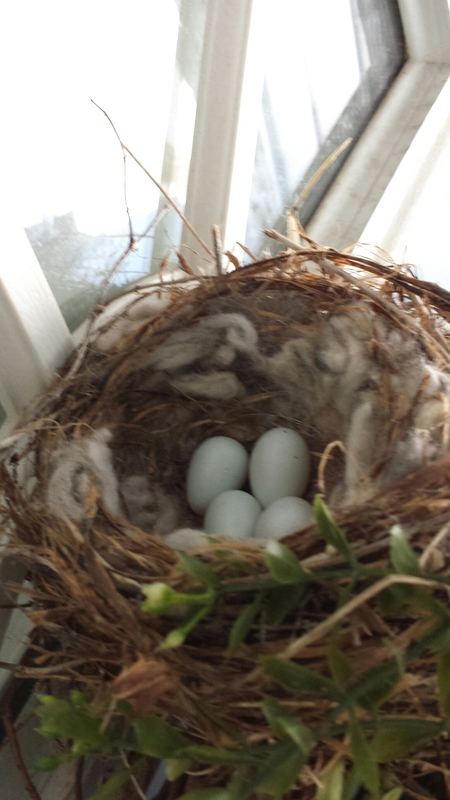 These are real bird-laid eggs, not some clever decoration from the local craft store. 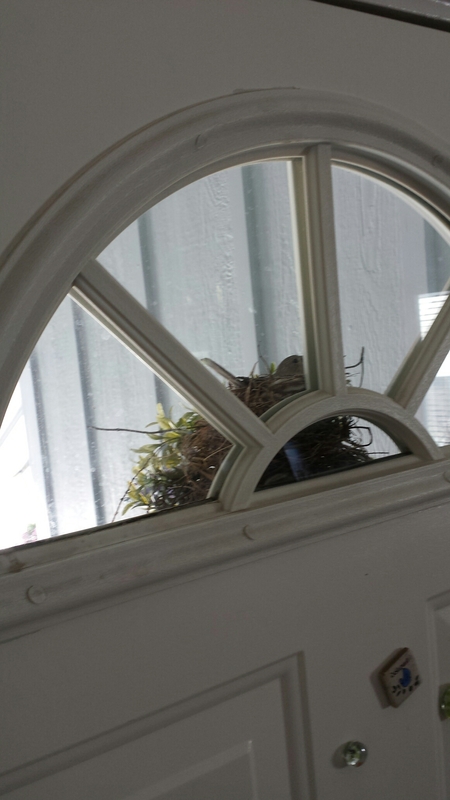 Our front door has a handy window right above the nest where we can get a little peek at eggs and mommy – though the bird is pretty skittish and I finally taped a piece of paper over the window so she wouldn’t take off every time we walked past the door. This is the best picture I could get of her without scaring her off. But we’ve seen her up close through our front window when she has perched on our hanging baskets. 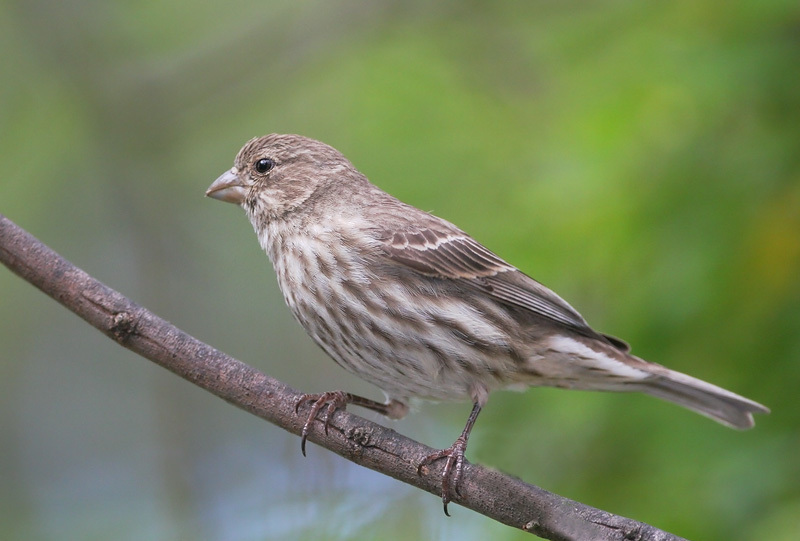 I finally found a picture online – she’s a House Finch. It’s been awhile since I posted any DIY stuff – mostly because I haven’t been doing any. I feel lucky to keep the laundry going and feed Haley and myself, since mostly I just want to lay on my bed and read! But I recently made a somewhat snap decision to give Spencer and Kayla one of my couches which then meant I had to start looking for some replacement furniture. When our family moved into our most recent home, we went from one small living space to two large ones. We had some hand-me-down furniture, none of which really fit our style or lifestyle. Since we had a little cash from the sale of our first home, we finally (after 10 years of marriage) invested in some grownup furniture. But we also had little kids who liked to build couch cushion forts. So while we bought grown up furniture for our “living room”, I went the CraigsList route for the family room. $400 later we had a nice big couch, love seat, chair, and ottoman. It was a great deal – the upholstery was a rough, tan-ish dirty color perfect for hiding spills and crumbs; the pillows made great forts; and best of all I didn’t have to worry about the kids ruining it, since I hadn’t spent very much on it. Fast forward to this fall – the love seat had developed a definite dip in the middle of the two seat cushions, the back cushions had been mushed out of shape so that they generally pushed the sitter off the couch, the chair was covered with cat fur that resisted cleaning, and the ottoman had been discarded after too many jumps had broken the frame. It was time to replace – especially since I think I’m finally past the cushion fort stage. I’ve wanted the bed-couch FRIHETEN from IKEA ever since I saw how cleverly it makes into a surprisingly comfortable queen size bed. Haley and I went down to IKEA, measured and imagined, went home and measured again. Then we went back and between the two of us (with a little help from some IKEA workers) loaded the giant boxes into our van, unloaded it into our house (sadly, without the help of the IKEA workers), and then put the thing together. It was/is awesome! Then came the question about what to put in there with it… everything I looked at wasn’t quite right or was way out of my price range. One night I was bemoaning my bad luck with my mom. Together we started looking at websites (I say together – we were on the phone, each looking at our own computers – that counts as together, right??). I found this great deal on club chairs at World Market Cost Plus. I could get two chairs for less than the price of one chair (that I didn’t really like) at IKEA (which was the least expensive chair I had found in the style that I wanted). The first catch? The chair was sold without upholstery and required the purchase of a slipcover sold separately. The second catch? Since the chair was being discontinued, there were no slipcovers available for purchase. Hmmm…. I talked it over with my mom – what did she think? Did the chair look like it would be difficult to cover? It was a pretty rectangular chair. Together we agreed that it was doable. So I bought them. 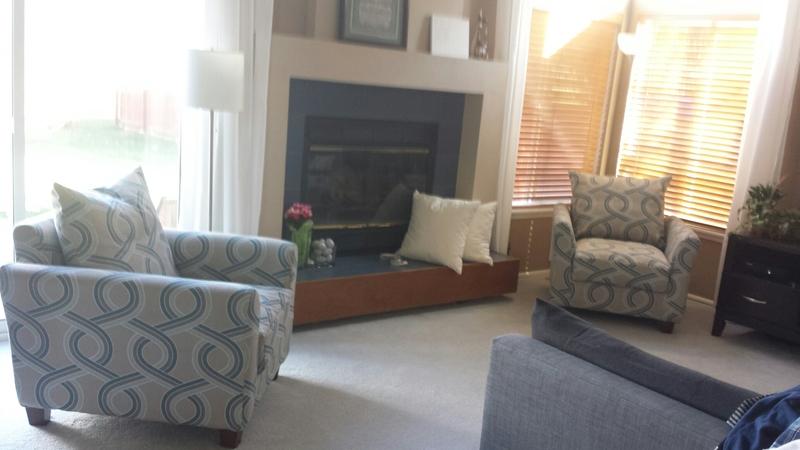 I have actually made slipcovers and re-upholstered furniture before. I made a very utilitarian slipcover from the cheapest fabric I could find for a hand-me-down love seat Tom and I had when we were first married. It was VERY rectangular and was a matter of sewing straight seams along rectangles of fabric. Super easy. I had re-upholstered a couch I inherited from my grandmother and sewn a slipcover for the matching love seat. It’s not out of the realm of my abilities. But I did those projects many years ago when I had a lot more time and energy. I was a little worried that if it was too difficult I would never get the slipcovers done and these chairs would be unusable. They came. I liked them a lot! But the thought of figuring out how much fabric I needed to buy kept me from doing much. I pulled out an old sheet and started working on a slipcover pattern – trying out how I wanted to fit things together, etc. But I started thinking that I was putting too much effort on a pattern and I needed to just start working with the actual fabric. Then I decided to go to Utah for my niece’s baptism, and my mother told me about this upholstery fabric store that was going out of business. My sister and I discovered that everything in the store was $3 a yard. Terrific prices! I decided that I couldn’t go wrong with that price and that I was bound to find something that would work. I was in luck! 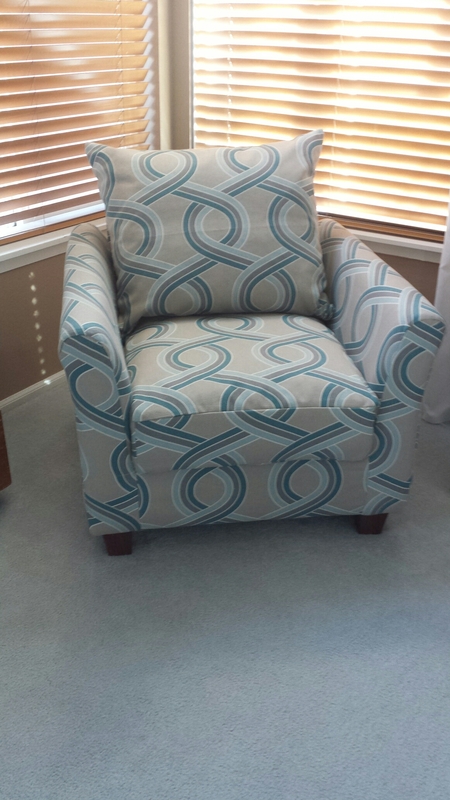 For around $50 I had enough fabric for my two chairs. Did I mention I have to make two of these? And then cover the back and seat cushions?? I have actually finished one chair cover now and am almost done with the second … and I have ordered and now have the zippers for the cushions. Maybe I’ll finish it all up over spring break. Watch here for updates!